Crater Lake is one of the most breathtakingly beautiful sights you’ll ever see, with its deep blue hue, and the stunning view surrounding it. 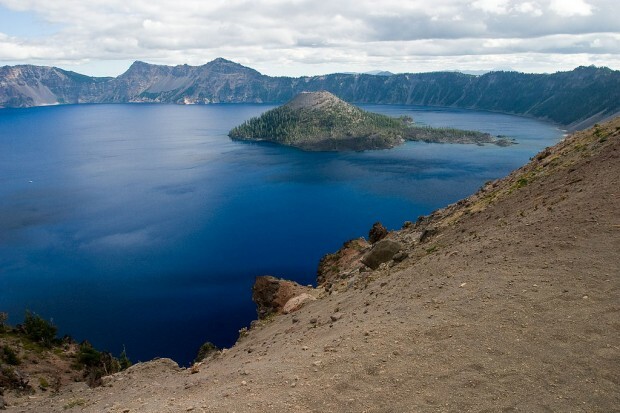 Crater lake is roughly five miles across, and has the third greatest average depth of any lake in the world. Crater Lake National Park is the only national park in Oregon, and the fifth oldest in the nation, having been established in 1902. The lake has no rivers running to or away from it, but is entirely filled by rain and snow, and prevented from overflowing by evaporation and subsurface seepage. Crater Lake was formed when Mount Mazama, the mountain on which it resides, collapsed following a tremendous eruption, which produced 150 times the amount of ash as the 1980 Mount St. Helens eruption. Crater Lake National Park gets more than 44 feet of snow per year, from October to May, leaving a window of just two to four months in which to visit the park, with average highs in July and August of just under 70°F. While it is an incredible sight, there is more to Crater Lake than just the view. The park has more than a dozen hiking trails, varying in distance from a half a mile, to eleven miles. The lake has rainbow trout, and kokanee salmon, with no limit on the size or number of fish caught, and no fishing license required! There is a variety of wildlife to see in the area, with deer & squirrels being the most commonly seen. Occasionally you might see herds of elk, or a bald eagle. foxes, porcupines, black bears, bobcats, mountain lions, and marmot are also in the area, but rarely observed. If you’re on the lookout for wildlife, dawn & dusk are generally the best times to look. Boat tours around Crater Lake are a real treat, and last about two hours. Another option is to get dropped off on Wizard Island, and spend the day there swimming, fishing, having a picnic, or hiking around & enjoying the view. Wizard Island tours last three or six hours—your choice. For pricing information and to reserve tickets for a boat ride, click here. While at the park, be sure to stop by some of the local restaurants and stores, and pick up a good meal and a souvenir. The Mazama Campground located in the park, has picnic tables, fire rings, public showers, drinking water, and other amenities, and is open to both tents & RVs. If you’d rather enjoy the night indoors, the Crater Lake Lodge and Mazama Village Cabins are both great options. Click here for a PDF Visitor’s Guide, detailing more information about the park’s attractions & rules.